A typical pen format for swine in many Iowa animal feeding operations. 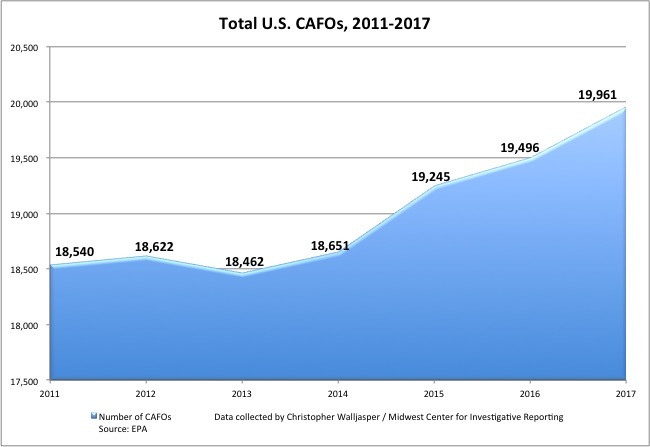 The number of new concentrated animal feeding operations (CAFOs) has increased across the United States over the past seven years – bringing the total operations just under 20,000, according to data from the Environmental Protection Agency. And Iowa led the way. From 2011 to 2017, Iowa went from having 1,648 CAFOs to 3,588, for a 117.7 percent change, according to an analysis of data from the EPA’s National Pollutant Discharge Elimination System. Delaware and Maryland fell to a distant second and third with just 881 new operations between the two states, with Delaware seeing a 600 percent growth and Maryland seeing a nearly 300 percent growth. Overall, the United States added more than 1,400 new large-scale concentrated animal feeding operations (CAFOs) from 2011 to 2017. That’s up 7.6 percent. A CAFO is defined as an “agricultural enterprises where animals are kept and raised in confined situations,” and most commonly contain hogs, poultry for meat and eggs, dairy and beef cattle. 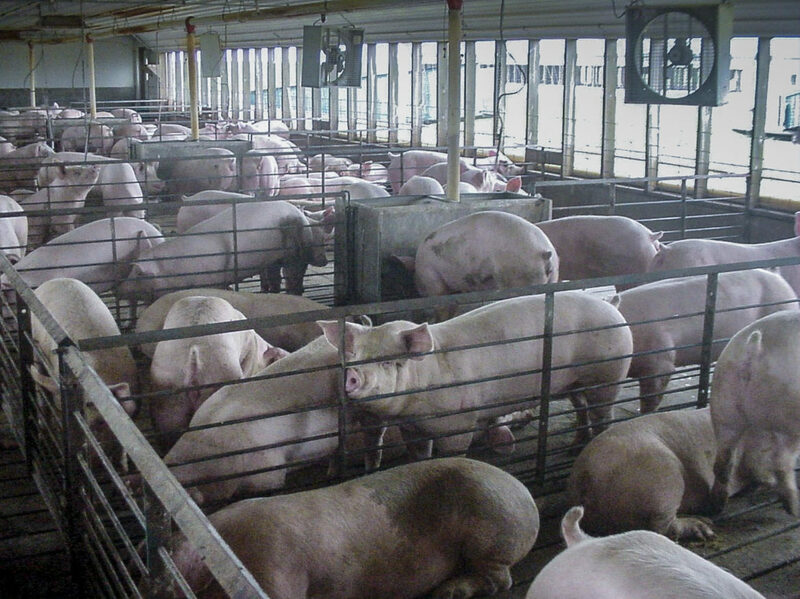 During the 2011-to-2017 span, Iowa led the nation when it came to increasing the number of hog production facilities in CAFOs, adding 3.4 million hogs in the facilities for a 17.2 percent increase, the EPA data showed. Iowa was third in the nation for increasing egg production in confinement facilities, adding 1.1 billion eggs over the seven-year span, and was fifth in cattle confinement production growth, adding 110,000 head raised in CAFOs, the data showed. Iowa, Delaware and Maryland added 2,821 confined animal operations since 2011, but a number of states reduced the number of operations. States showing the biggest drop in operation included Arkansas, Oklahoma and Illinois. A look at the amount of animal production across these states can be one insight into the changes in the number of confinements. Delaware saw a 1,000 head drop in the number of beef cattle, but the state added 42 million broilers – chickens raised for meat – since 2011, according to the USDA’s National Agricultural Statistics Service. Map: Change in CAFOs, by state. Click on the state to see the change in number of CAFOs from 2011 to 2017. Maryland decreased the number of hogs, dairy cattle, broilers and beef cattle, but produced an additional 265 million eggs in 2017, compared to 2011. Iowa added animals in nearly every category, with more than 3.5 million hogs, broiler chickens and dairy cattle and an additional 1.1 billion eggs in 2017. Arkansas’ drop in operations since 2011 can be seen in nearly 112,000 fewer hogs, beef and dairy cattle, even as the number of broiler chickens and eggs in the state increased. Oklahoma saw nearly the opposite since 2011, with 78.5 million fewer eggs and 10 million fewer broilers produced. While poultry production in Oklahoma declined across the seven year span, the state did produce an additional 1.2 million hogs and 50,000 beef cattle in that time, but still lost CAFOs. New York produced 107,000 fewer hogs and Illinois dropped more than 5,000 dairy cattle. In the United States alone, air pollution kills about 115,000 people a year — more than three times the number of deaths caused by motor vehicles. Worldwide, some 7 million people died in 2012 alone from exposure to air pollution, according to the World Health Organization.